Wisdom to Create a Life of Passion, Purpose, and Peace This inspiring tale provides a step-by-step approach to living with greater courage, balance, abundance, and joy. 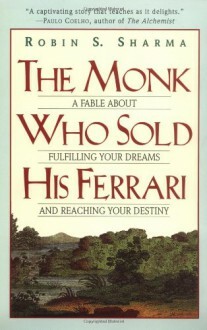 A wonderfully crafted fable, The Monk Who Sold His Ferrari tells the extraordinary story of Julian Mantle, a lawyer forced to confront the spiritual crisis of his out-of-balance life. On a life-changing odyssey to an ancient culture, he discovers powerful, wise, and practical lessons that teach us to: Develop Joyful Thoughts, Follow Our Life's Mission and Calling, Cultivate Self-Discipline and Act Courageously, Value Time as Our Most Important Commodity, Nourish Our Relationships, and Live Fully, One Day at a Time. This book sure does live upto its reputation. My last book for 2012. A great book to start the thinking process.